The Awkward Yeti encompasses a variety of comics about life, introversion, science, and the balance of our inner dialogue. 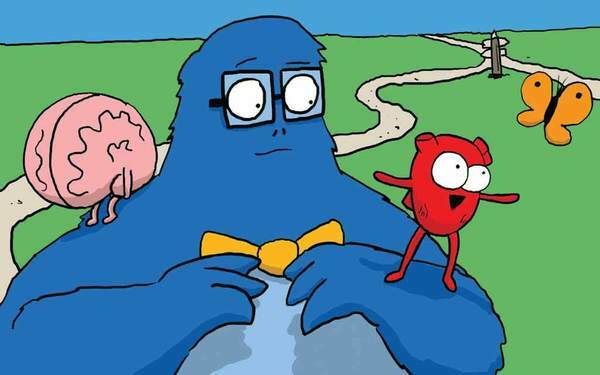 See mundane ailments turned into epic stories, decide whether you’re more of a Heart or a Brain, and try to see which of your friends is the most “Lars.” The Awkward Yeti is like reading multiple webcomics in one series, all from the same creator. Lars: The central character and star of The Awkward Yeti, Lars is an introvert trying to find his place in what feels like an extrovert’s world. Vince: Lars’ brother is muscular, confident, and a little simpler. Vince and Lars get along well, but have very different approaches to life. Herschel: in his infrequent appearances, Herschel is the consummate “sales guy,” using basic tactics to win people over in nearly all of his conversations. Lisa: an ongoing love interest, we’re never quite sure if she’s humoring Lars or not as she accompanies him on dates. Brain: introduced during the second year, Brain begins to reveal Lars’ inner dialogue and source of anxiety. Heart: a later addition to the cast, Heart balances the superego-inspired Brain with his optimistic, Id-like approach to the world, acting more on emotion than societal constructs. Gallbladder: an infrequent, but incredibly popular character, Gallbladder happily “maked” stones for the liver, only to be rejected. The ensemble of organs and objects: an ever-growing cast of organs and objects fills the microchasm within Lars’ world with conversations between Stomach, Tongue, Tooth and many others. Most of these characters recur from time to time.